Looks like we won’t have to be waiting for much longer. 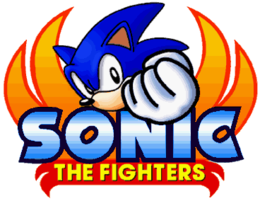 Coinciding with the Japanese release, Sonic the Fighters HD (along with Fighting Vipers and Virtua Fighters 2) will become available digitally to Western audiences as early as next week! The official SEGA Blog has confirmed that the upgraded brawler, which boasts online play and extra playable characters previously unavailable in the original, will roll out worldwide beginning from the 27th of November for North American PSN users at the cheap price of $4,99. This translates to 400MP on XBLA, with the arcade title releasing around the world the following day. PSN users in Europe will have to wait until December 5th, where the game will be priced at €4.49/£3.69. So, who’s excited to throw down in fisticuffs on the online ring? SEGA has seemingly accidentally released four screenshots of the Sonic the Fighters port that is still only officially confirmed for Japanese audiences. The screenshots appeared recently on SEGA Press, but were quickly pulled. Fortunately, SSMB member Woun managed to snag them while they were there. You can view them in our gallery after the jump. 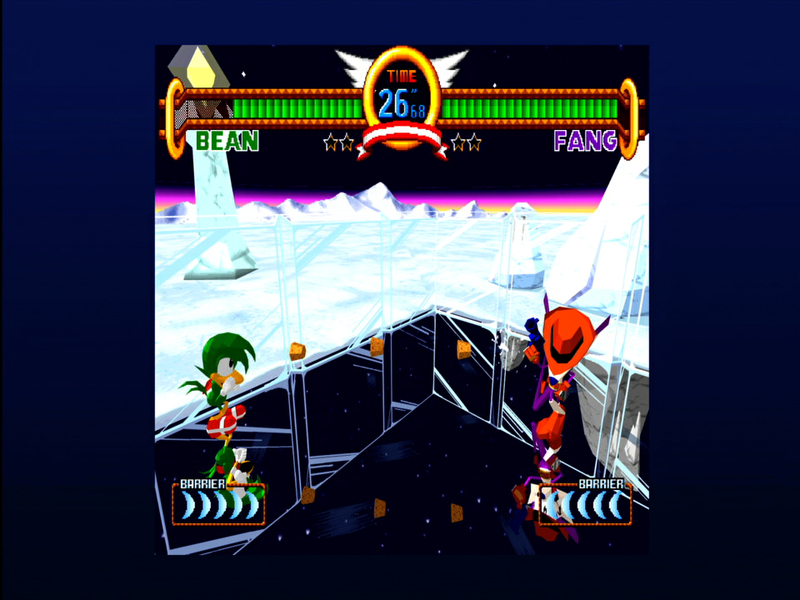 In other news, Sonic the Fighters‘ Xbox 360 achievements have appeared online today, courtesy of eXophase. There are 12 achievements and a total of 400 gamerscore to earn. Hit the jump to see the list. Amidst the flurry of classic SEGA titles hitting XBox Live Arcade and the Playstation Network last week, it may come as no surprise to many that whispers of potential releases of other classic games are circulating. A recent tweet from XBL enthusiast @lifeflower lists the “unannounced/rumoured” release of three classic SEGA titles including Fighting Vipers, Virtua Fighter and Sonic the Fighters, displaying a screen grab of a USK rating for each of the games on their release schedule page. While still officially unconfirmed with no information on extra features these games may have, many fans will be happy at the potential prospect to revisit one of the lesser-known titles from the Sonic franchise, along with other seminal beat’em ups from the SEGA Saturn era. Props to eagle-eyed SSMB members NiGHTS and goku202006 for spotting this! Sound Test Saturday: 21st Anniversary Edition! My readers, this day is what all true Sonic fans strive for! Yes, today is June 23rd, and you all know what that means! The Blue Blur himself, Sonic the Hedgehog, is celebrating his 21st birthday today! So, let’s have a bit of an extravaganza ourselves! 21 is the magic number, so why not go for that many tracks, just for today? A great number of these tracks have been tipped by you guys, and I thank you all for your contributions! Due to the sheer amount of music to be featured beyond the jump, I’ll refrain myself from commenting on each track. Instead, I will leave you all with this. If everything goes according to plan here, Sound Test Saturday will be moved to SEGASonic: Radio next week. Yes folks, SS:R will return sooner than you think! And with the big move, we will introduce a new feature on our weekly music column: interviews! First ones up are Freen in Green, followed by xTrickyWolfy and Ring Energy should all go well! If there is any particular artist you would want featured on a future Sound Test Saturday, if there are any remixes, covers, or originals you want to share, if you have work of your own you would like to see up on the site, then do not hesitate to notify me at vizardjeffhog@sonicstadium.org! That being said, Happy 21st Anniversary, Sonic the Hedgehog! Still unstoppable after 21 years! Continue reading Sound Test Saturday: 21st Anniversary Edition! 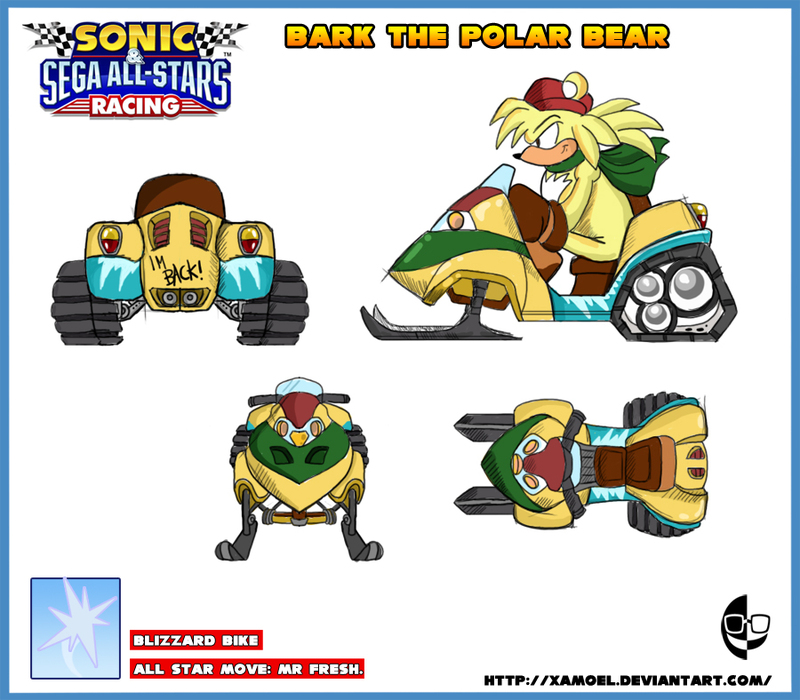 Bark the Polar Bear Returns! 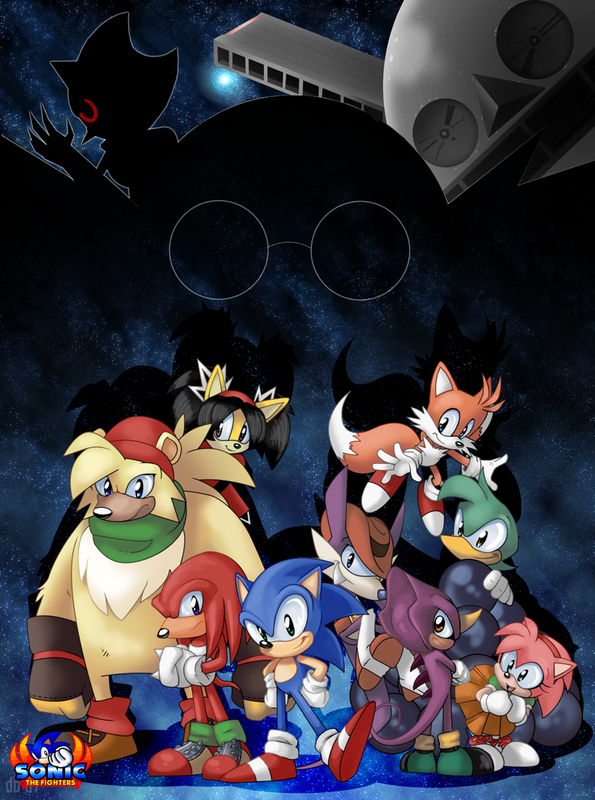 I now await for this deviation to get a bajillion favorites just because it has Sonic on it. Hell, darkburraki, I think you should get a bajillion favorites for including Honey, a character not even included in the game. As usual, click the thumbnail for a larger image. EDIT: Whoops! We accidentally called DarkBurraki a guy. She is, obviously, a She. Which, given that she’s not a guy, would narrow down her gender a bit. Sorry about that, and thanks for letting us know about that blip, best-buddy “Leedz”. Sega of America have recently made some slight changes to their Sonic Gems Collection page, nothing particularly noteworthy other than the following tidbit that caught our eye. 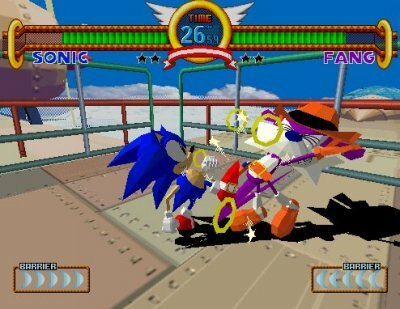 Join Sonic and your favorite cast of Sonic characters in this action-filled 3D arcade fighting game. Tails, Knuckles, Amy, Espio, Fang, Bean and Bark battle it out with Dr. Robotnik and the evil Metal Sonic in head-to-head or team battles. 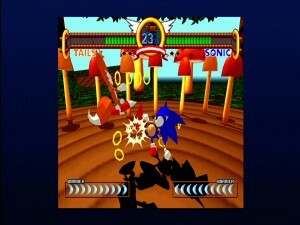 Get ready to rumble….Sonic style! Team battles in Sonic the Fighters, one of the first new enhancements (and hopefully the first of many) to be revealed as an addition to feature in Sonic Gems Collection. Stay with SONIC NEWS for more Sonic Gems Collection information. Earlier today SEGA’s Japanese page for the upcoming Sonic Gems Collection was launched providing a host of new information about the game, all of which can finally be set in concrete thanks to it coming directly from an official source. The site, which is laced with some beautiful new-classic styled artwork provides us with the following. 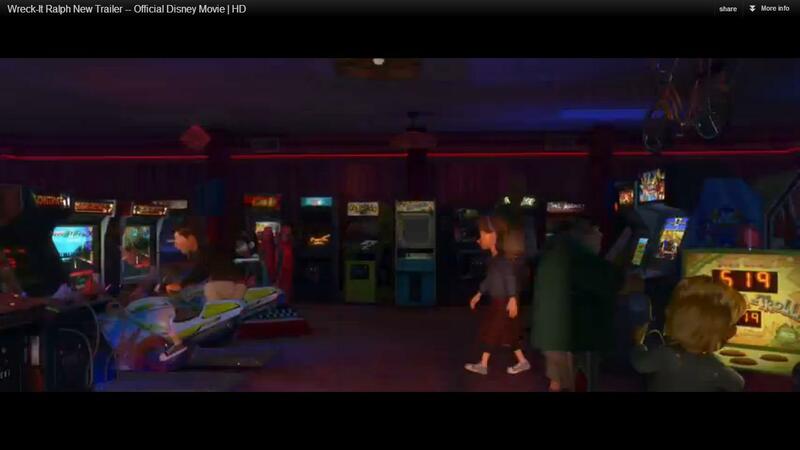 The game will be released in August this year on Playstation 2 and GameCube. Finally, what everyone has been waiting for, the list of games to be included in this compilation. Well, with all the rumours being banded about well in advance of E3 2005, the announcement of Sonic Gems Collection was no real surprise, although it was a pleasing addition to the roster of upcoming Sonic titles. ‘Gems’ was first fired up for rumour when SEGA filed a patent for the name of the game, along with a logotype. Many suspected, due to hints being dropped by Yuji Naka and the similar namesake to Mega Collection, Gems would be a compilation of the hard-to-seek Sonic games. One of the bugbears of SMC was the omission of Sonic CD, which Sonic Team would seem want to address. The demo pod for Sonic Gems Collection was discovered at Nintendo’s E3 booth, which added fuel to the rumours of Gamecube exclusivity. We have a feeling that the game is headed for the PlayStation 2, according to our sources. No word on XBOX, but assuming Mega Collection got the multi-format treatment, it would seem odd that Microsoft would be left out of the Sonic love. Some may think that Sonic CD, Sonic the Fighters and Sonic R is enough for the compilation, regardless of the conservative choice of adding some Game Gear games. And that’s fair enough. We can clearly see why Sonic Team chose this selection of GG games too – these were the titles that were mercilessly missing from Sonic Mega Collection + on XBOX and PS2 – furthering the idea that this could be heading for consoles other than Gamecube. All the Game Gear games were present in Sonic Adventure: DX however, which makes the selection here rather dubious on Nintendo’s platform. Despite the appeal of Sonic CD and ‘Fighters, we hope there’s room for some unlockables, akin to the original Mega Collection. 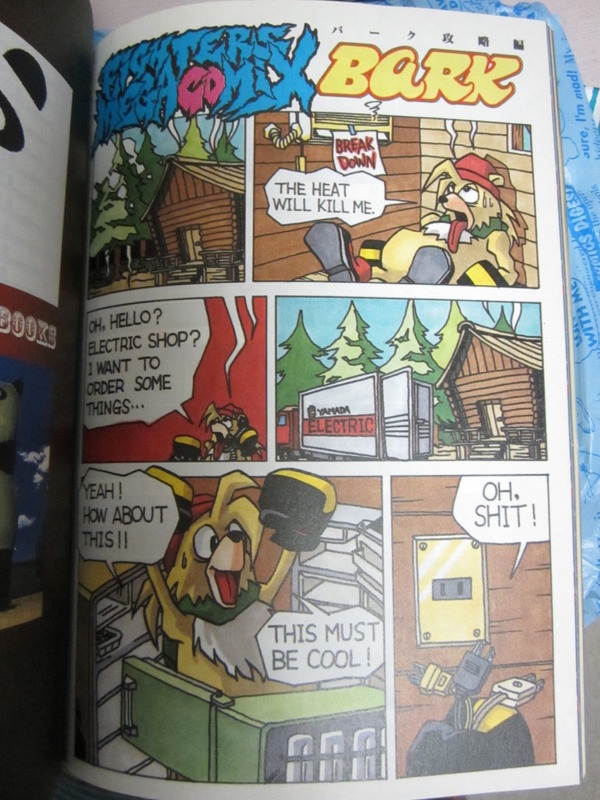 Our “Sonic Collectioning” would be complete with at least Chaotix and SEGASonic the Hedgehog in the mix. As mentioned before, it would be slightly odd to have half the offering on a new Gamecube collection being something you could just get elsewhere (SA:DX). The screenshots and common elements seen in Sonic CD and Sonic R show PC versions – which means Gems must be using some kind of PC emulation to run these versions of games. Which is fine by us, as long as we don’t get Windows XP runtime errors booting up Sonic CD. The extra offerings are what makes a retro compilation from Sonic Team so good. Sonic Jam still remains the ultimate king, with a 3D explorable world full of Sonic history, artwork and exclusive Japanese movies up the wazoo. Sonic Mega Collection managed a timid smattering of Archie cover scans, a yawnsome full scan of their tiresome “Firsts”, and some movies of little interest. Sonic Mega Collection + took things better (or worse) when the only movies they had involved Sonic Heroes in-development scenes (of which half were just the finished movies anyway). Special extras have turned out to be nothing but a crock as of late. Let’s hope this changes somewhat – the images above, taken from the official website, shows a new section called “Sonic Museum”. According to the Japanese site, there will be many secrets including movies, character profiles and artwork. So far, so good, Sonic Team. So far, so good. Now we’re all up to scratch on what Sonic Gems Collection is all about, it’s only a matter of time before we get more details. Hopefully, if we can get extras on the scale of Sonic Jam-style quality (even if we can’t have many of the quality Japanese adverts or movies, just having some will suffice) and squeeze SEGASonic the Hedgehog and Chaotix in there, this collection will surely live up to its name. Woo, this is the calm before the storm. The E3 event’s yet to start (Wednesday), but the major companies are spewing forth their latest consoles and it’s exciting to see! SEGA have been on form though for next gen, and SONICTEAM’s creativity certainly lives on! We’ve just seen a trailer for a new Yuji Project, called Fifth Phantom Saga. Check SONIC NEWS for the first info, and check out the new TSS Game Page for the title. AND, Sonic Gems Collection IS A REALITY. We’ve only seen a Gamecube stand for it though, which fires up the rumours that Gems will be a Nintendo exclusive. SONIC THE FIGHTERS and SONIC CD are the only titles known to be on the Gems Collection at this point. Yuji does love us. It’s only been a day and all this has spewed forth – remember, only at The Sonic Stadium and SONIC NEWS can you catch the SONICTEAM E3 information and media first. We’re not the #1 Sonic Resource for nowt you know. 😉 Nintendo’s conference is later on, and more SEGA surprises are apparently in store, so we’ll let you know on any breaking details.